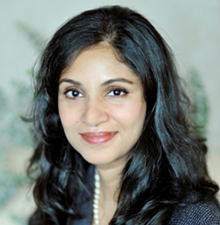 Nayantara Bali, until recently, was a Vice-President at Procter & Gamble leading their Beauty and Hair businesses for Asia-Pacific. She is a business leader with a proven track record for business results and people development. Her experience spans a large range of categories, including Personal Care, Hair Care and Colour, Baby Care, Feminine Care and Male Shaving (Gillette). She has also successfully led Diversity & Inclusion initiatives for P&G Asia since July 2011. During her tenure, female manager representation rose to close to 50% in P&G Asia. Nayantara is known for understanding complex situations and applying sharp strategic thinking, intuition and insight to actions that drive results. She also served as a Director on the Boards of Procter & Gamble Gillette India (2011-2013) and Procter & Gamble Health & Hygiene India (2003-2005). Nayantara is an alumnus of IIM Ahmedabad (PGP88) and Stella Maris (BA Econ 1986).